So I've arrived in France! My trip started at 3am Saturday morning as I left to catch the Shuttle Express to the airport. That's a very good deal if you don't have friends to split a cab with - only $19 each way if you take it from a hotel. If you have them pick you up it's more like $40. Second flight was really fantastic. Although I flew Delta, it was actually an Air France flight and probably the best trans-oceanic flight I've been on. For starters, there were two meals on the six hour flight, a dinner and a breakfast. Dinner started with a menu from which you could choose one of two entrees. I had the chicken frickassee with mashed potatoes, cous cous salad and salmon, rice pudding, lemon cake and cheese. You could have a free alcoholic beverage if you wanted. There were also drinks stations so you could get up and get a drink whenever you wanted, and plenty of tea and coffee. Breakfast was a roll, orange juice, and yogurt. Delicious! Airplane food sure has improved a lot since my trip to Japan. I managed to sleep on the plane so when I got to Paris it sort of felt like afternoon (although time-wise I was pretty disoriented). I met up with my friends and we decided to go to the Marais for food. We sat in a cafe and enjoyed tarte and then walked around to look at all the shops and see the Jewish Quarter. I took many pictures - Paris is a photo heaven so far! We were pretty exhausted after that so that ended the day. 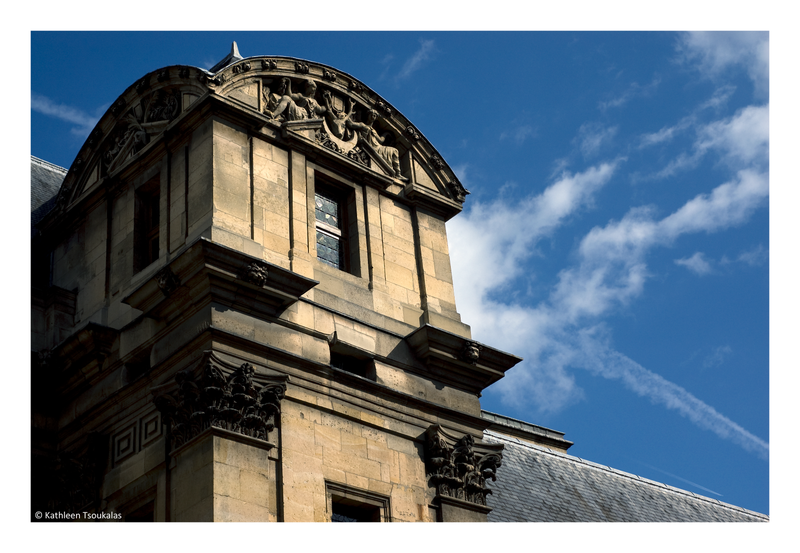 Building in the Marais - photographer's paradise! Day 2 was a trip to Normandy and Juno Beach. It was a long haul and there aren't many tips on the net for something like this. Since my guidebook is for Paris only, I decided to wing it. The first thing you need to take into an account for a trip to Normandy from Paris is, the train to Caen only leaves once every two hours. I got to the station just before ten, and my tickets were for 12:25. The train takes two hours, and then you need to take a bus to get to Courseulles sur Mer, which is where Juno Beach is. The directions I read say the bus takes 25 min, but it took over an hour. By the time I got there and saw everything I wanted to see, I had to take a taxi back to Caen since the buses had stopped running. It's very important that if you want to go out there by bus, go early! Taxi is much more expensive. 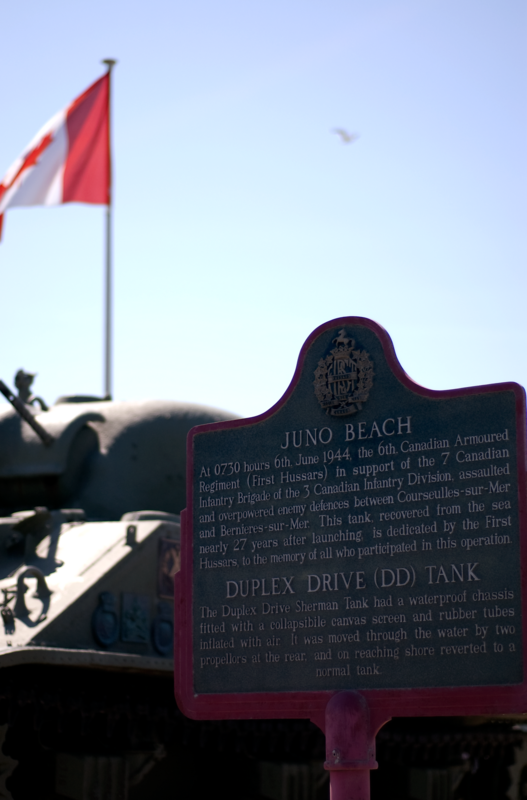 Tank, Canadian flag, and marker at Juno Beach. All in all it was still worth it. The museum is great and filled with interesting artifacts. You can go through a real bunker on the beach, see tanks and artillery, and walk on the beach itself. There are Canadian flags everywhere and even the streets are named after Canadian provinces (Rue de Quebec, for example). As I said on Facebook, I have seen many pictures of the D-Day landings and Juno Beach itself, but you get a much different feeling standing there and imagining it taking place. The beach is massive and really is as flat as they describe in history books. It really is impressive to think about. Panorama view of Juno Beach: 12 photos stitched together! The nice thing about the train to Normandy is I got a look at the French countryside. I saw rolling, gentle hills, farms, chateaux, and even a huge fortress. There were plenty of animals and I especially noticed the geese/swans. Towards Caen and Courseulles sur Mer, there are a lot of large horse farms. Horseracing's popularity was evidenced by the many signs seen for 'hypodromes' and the man beside me on the train back to Paris proudly showed off his betting stub, from which he'd won 900 euro! Tomorrow I'll go to Chantilly to check out the Museum of the Horse, so I'll have more to tell then. A few different people have said something to the effect of "it must be hard traveling here when you speak so little French". It's really not! I think many tourists, from what I've seen, can't even form sentences independently and need the guidebooks' suggested phrases and words, so if you have as much French education as we get in Canadian schools, even if the teacher's aren't all fluent and you don't end up with perfect accent, grammar and pronunciation, you will be just fine. I was able to get by in Japan and China on much, much less, so this comment always surprises me. Wow you are such a great traveler! I'm sure lucky to always have you telling me the best places to go! Ps. If you can live in Japan and get by..you can communicate and get by anywhere in the world! I have mastered the art of gesturing! haha have fun!